Many of the findings described in the landmark Acheson 1959 paper are very much relevant to our understanding of ME today. The disease was initially thought to resemble poliomyelitis until distinguishing features occurred; no patient developed the paralysis and muscle wasting seen in poliomyelitis which is a disease of the spinal cord. Naldrett White, a Canadian neurologist, and Robert Burtch, an American family physician, described an epidemic in 1950 in Upper New York State in the USA in an area close to the Canadian border. They thought that muscles were directly involved during the initial infection. Accompanying a mildly elevated temperature to 99–100 ºF (37.2–37.8 ºC) in nearly every patient, there was pain and tenderness in various muscles sometimes with increased skin sensitivity over the affected areas making contact with clothes or bedding very unpleasant. In contrast to hypersensitivity, difficulty in moving limbs and numbness with diminished skin sensation on clinical testing suggested peripheral nerve involvement. Where there was weakness on using a hand and sensory symptoms, examination revealed an ulnar nerve disorder. Nerve roots were sometimes involved in the legs and were tender to pressure. This was associated with dragging of the legs on walking or foot drop. Another feature was lymphadenopathy in some patients. Enlarged tender anterior neck or axillary lymph glands are mentioned. The illness had a striking resemblance to the disease described by Sigurdsson and others in Iceland during the winter of 1948–1949, and hence the name Iceland Disease was suggested for the illness. 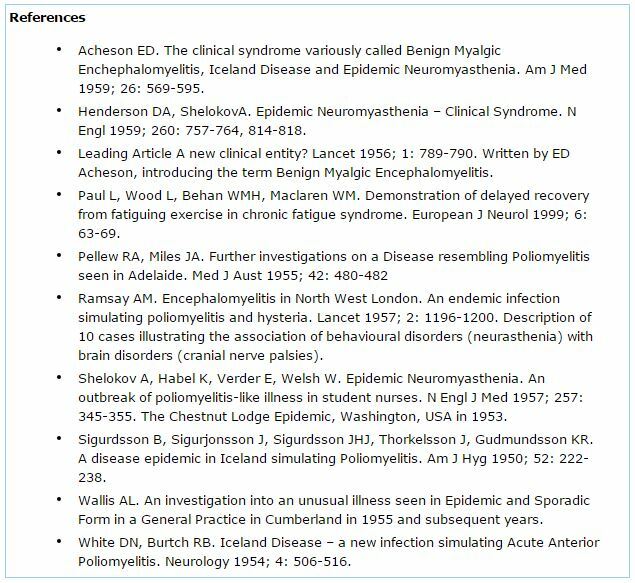 In a leading article published anonymously in the Lancet in May 1956, Acheson reviewed eight similar outbreaks and suggested a title Benign Myalgic Encephalomyelitis for the new clinical entity based on the presumed underlying pathology. He considered the disease to be "benign" compared with other epidemic infections of the nervous system seen in various types of encephalitis and in poliomyelitis due to the absence of patients dying. However, "benign" was later deleted from the title, leading to the abbreviation to ME, because in some cases the severity and duration of the disability resulting from the disease was far from being benign. He mentioned that hepatitis and enlargement of the spleen might occur in addition to lymph gland involvement indicating the reticuloendothelial system participated in the clinical picture in some of the epidemics. Alexis Shelokov and colleagues investigated an outbreak involving 50 student nurses and their tutors participating in residential courses at a psychiatric hospital near Washington DC, USA in 1953. Half the patients had muscle weakness and poliomyelitis was suspected then eliminated. No other cause for the muscle weakness was found. All patients had features of a generalised illness similar to that described in patients with Iceland Disease. After the initial illness there was a subacute phase lasting several months consisting of episodes of feeling unwell and further muscle weakness. Donald Henderson and Alexis Shelokov reviewed 23 similar epidemics in 1959. They found that the affected muscles were tender either diffusely or in focal discrete areas, which felt "oedematous, doughy or rubbery in consistence". They introduced the term Epidemic Neuromyasthenia, linking neurasthenia with myasthenia to describe the clinical picture. The term neurasthenia is unfortunate as it implies a disturbance of behaviour, which can follow an infection or be the result of stress, in the form of irritability and an inability to take exercise without excessive fatigue. Similar disturbances including crying spells without provocation are also seen during the convalescence of patients who have had strokes or head injuries. The association of similar behavioural disturbances with brain cell disorders such as cranial nerve palsies and hemiparesis with extensor plantar response is mentioned by Henderson and Shelokov (1959) as an occasional finding in some epidemics. The association is clearly illustrated by Melvin Ramsay in a serious of sporadic cases admitted to an infectious diseases department of a local hospital from the population of North West London in 1955 and 1956. Rather than labelling the illness neuromyasthenia a slight change to neuronomyasthenia indicating a disease of nerve cells (or neurones) and muscle cells with muscle weakness might be more appropriate. Neurologists prefer to limit the term myasthenia to myasthenia gravis, a disorder of the neuromuscular junction which may present as a severe type of muscle weakness. In patients with Myalgic Encephalomyelitis/Neuronomyasthenia (ME/NM), "myasthenia mitis" has been used to describe a milder form of myasthenia in which muscle weakness develops during normal daily activities. Clinical tests were subsequently developed, which measure the declining muscle performance with activity and the slow recovery of muscle afterwards. In 1998 this delayed recovery of muscle function after a fatiguing isometric exercise test was confirmed in 1999 by Lorna Paul and colleagues. Abnormalities of blood vessels have been described in these epidemics of ME/NM. Infectious material was transferred from patients to monkeys during an epidemic in Adelaide, Australia in 1949–1950. The monkeys became ill and post-mortem examinations were carried out a month later. The only abnormalities discovered by Pellew and Miles (1955) were minute red spots along the course of the sciatic nerves. Under the microscope the red spots contained localised collections of inflammatory cells, which had also infiltrated the area where the nerve roots come out of the spinal cord. The red colour of the spots was due to leakage of red blood cells. ME/NM is very rarely fatal so that a post-mortem study showing similar haemorrhages in humans is unique. However, during the North of England epidemic in 1955 Andrew Wallis described the findings in a patient in her fifties, who developed the characteristic febrile illness leaving her debilitated and emotional. During the next fifteen months she continued to run a low grade fever with continued mental deterioration before she died. The post-mortem revealed numerous small haemorrhages around blood vessels in the cerebral cortex extending into the mid-brain, which were considered to be the cause of her death. These abnormalities may be found when patients die as the result of severe chronic alcoholism. This was not a factor in her case; she had had a febrile illness. Vasculitis involving the skin was recorded during outbreaks in Cumberland, Durham and North West London in 1955. A maculopapular rash may appear during the return of features of the initial illness such as flu-like symptoms and enlargement of lymph glands and liver. This skin overlying areas of localised muscle weakness may be affected at the time of these attacks. In conclusion, Iceland Disease and ME/NM is a muscle/brain disorder, which occurs as clusters of cases in families, in institutions such as hospitals or schools, in districts as far apart as the northern townships in Iceland and Adelaide in Australia or sporadically. It is an infectious disease with an incubation period of 5 to 8 days. Acheson in 1959 used the expression "in a greater or lesser degree" to describe "the symptoms and signs of damage to the brain and spinal cord" in this disease. This expression can also be applied to the febrile illness and muscle involvement. Many patients recover and return to normal activities in weeks or months, while others have relapses with reactivation of features of the initial illness and further damage to new areas of the brain or muscles. In extreme cases deterioration may lead to death. Muscle weakness has been measured in a few patients. After activity the recovery of muscle power is prolonged to an extent not recorded in any other disease. The association between these findings in muscle and vascular abnormalities in blood vessels and blood components needs exploring. For research purposes ME/NM patients with these physical signs should not be coupled with patients whose main illness is chronic fatigue on exertion and who do not have these signs.